‘…AND A KIND WORD’ | Connecting with You! 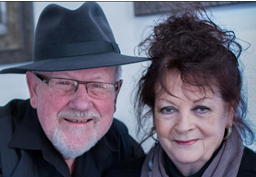 Mentioning in a July Facebook that we’d just celebrated our 55th wedding anniversary, we received many congratulations from not only friends but also from strangers! Naturally we were pleased. We knew the major reason behind our many years together – what we call the BMT – Blessed Marriage Triangle…God is the head at the apex and we’re at each corner of the base. He continually reaches down to each of us, connecting with us and ensuring we’re firmly connected with each other and with him. The marriage ring traditionally symbolises the perfect unbroken circle of unity (we go along with that) but we also like the unbroken strength of our marriage triangle. Any marriage is open to trouble, challenge, misunderstanding, satanic attack, disenchantment, disillusionment and other mishaps – but allowing God to link couples together brings us through. No…what this introductory comment leads to is this: We had acknowledged our thanks by airmail, Facebook, phone or face-to-face to everyone who had been kind enough to reach out to us, eg a big thank you to all, our appreciation of the encouragement kindly shown. Saying ‘thank you’ – and acts of kindness – are often missing today! We were strolling through Werribee Plaza when two guys in their thirties walked out of a bank in front of us, so casually and chatting away, opposite the cafeterias. We noticed one sticking his hand in his pocket and quickly removing it. For a moment we couldn’t believe what we saw next…something was floating to the ground. What was it? we wondered, coming closer, aware that nearby seated diners were suddenly eyeing the folded bundle. I (Robert) hurried forward and picked it up…to discover more than five hundred dollars! The guys had continued to saunter on and I rushed up to them. Their glare changed to bewilderment when I held up the wad of green stuff! The one who’d dropped the bundle quickly searched his pocket, then stared at me, pocketed the money, glanced at his friend and they both casually strode off. Not one word of thanks! Bad, yes. Now we presumed they weren’t Christians … but it’s worse when again and again we learn that some Christians haven’t thanked whoever has blessed them. Personally we readily say thank you to everyone…restaurant servers, shop assistants, traddies, mechanics, friends…any and everyone who does something kind for us. In fact, if we were to suddenly think that we hadn’t done so, we’d be horrified and contact the person to apologise. Take this week for example…some good friends – and a young chap whom we’ve never met before – willingly came round to tidy up our garden that had been messed up by that flash flood earlier this year. As I (Robert) am still recuperating after last year’s heart operation, I haven’t been able to do any heavy gardening maintenance and I’ve deterred Maureen from doing so (willing as she is!). We certainly thank them all! Saying thank you is like giving someone a kind word. Everyone needs a kind word – it’s an encouragement that goes a long way, even more than we know at times. It’s a blessing! Paul says, in Ephesians 4:32NIV, ‘Be kind and compassionate to one another. GNB adds ’and be tender-hearted,’ the Message adds ‘sensitive.’ Kind thoughtful people doing good deeds sounds like ‘acts of kindnesses’ to us. In this connection, back to our marriage…we were married so young(! ): Like any new wife, Maureen had to learn her husband’s silly ways and put up with me (naturally suggesting character changes – all necessary of course – that have helped mold me into a better man! Thank you, darling). 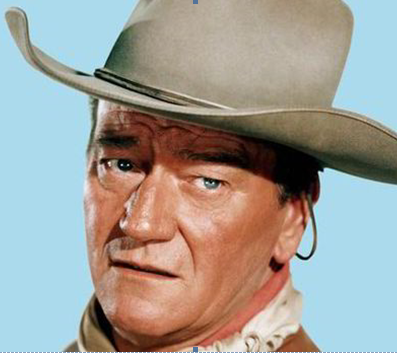 But one thing she could never change – and never will – I’m a John Wayne fan! Always was and always will be. The Duke is the man! The world (that is the celluloid world), whether the Wild West, devastated Europe or war-torn Pacific, erupting on-fire oil-wells, Communist infiltrated Hawaii, stressed African animals, endangered airline crew or passengers, uneasy Alaskan gold prospectors, troubled Ireland, London, Chicago …whoever, wherever … other locations and hot-spots were safe as long as Big John was on hand! Maureen wasn’t going to movies back 55 years ago and had to quickly learn about my hero! Oh my beloved still puts up with me and we enjoy watching the Duke on DVD, especially every Saint Patrick’s Day…every year The Quiet Man comes out and we watch Sean Thornton (John Wayne), from American, win the heart of Irish redhead Mary Kate (Maureen O’Hara) and floor her arrogant loudmouthed brother, Red Will Danaher (Victor McLagen)! John Wayne was the quintessential hero willing to take risks and deal with difficult or violent situations but with a soft heart underneath. He was known for his tough guy roles, loyalty to the flag, stand for justice, fighting brawlers, heavy drinking and later his winning out several times against cancer. 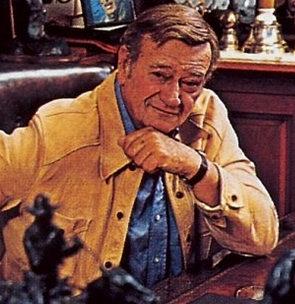 Before heroes such as Callan, Taken‘s Bryan Mills, Rocky and Rambo, moviegoers always regarded John Wayne as the man. To be kind is to be gracious – that’s what its Greek word, chrestos, means, to be useful in showing kindness. A simple kind word such as ‘thanks’ can mean so much to anyone. Oh some may respond by reminding us, ‘But that’s my job’ but deep down they really appreciate our acknowledgement of their assistance. It’s an encouragement! Showing kindness, saying thank you, isn’t some sort of weakness – it’s the civil, the Christian, the right thing to do. Being thankless, ungrateful is wrong! God, our perfect example, is kind – even to the ungrateful (Luke 6:35KJV). And we’re supposed to be made in his image!